Being a car guy, I love to see the old cars shown in period movies and TV shows, but...being a car guy I am kind of nitpicky about it too. They usually do a pretty good job of limiting the cars to the time of the show, and also including older cars, but they are always shiny, clean, and restored looking. Occassional gaffes with newer, bigger rims and lower profile tires pop up sometimes too. Just watched "The Green Book" set in 1962 I think, they show a street scene from a poorer neighborhood a number of times, the cars are older, but all clean and shiny, the new Cadillac they drive throughout the movie (actually a pair of them, in turquoise!) Looks shinier than a 1962 paint job ever was new, pretty obviously a base coat,/clearcoat finish. Oh, I can watch the movie and still enjoy it, and I know, movie cars have to come from somewhere, and most all 1950s cars that are still around now look like they are pushing 70 years old or they are restored. However, they spend so much effort and money on costumes and sets, you'd think they could put a little "aging make-up" on the cars too. nor amI losing sleep, more just curious if anyone else notices the same or similar. you'd think they could put a little "aging make-up" on the cars too. We do sometimes. 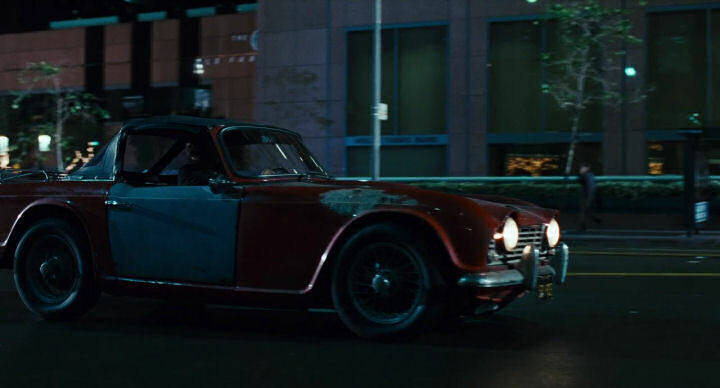 One example was Dave's TR4 in Alvin and the Chipmunks. That car was in much better shape when it was purchased for the movie. People forget what paint decades ago looked like. Yes the modern finishes you can get even on economy cars looks great, but it isn't accurate for vintage autos. I did the Tiger in an acrylic enamel had polished out and I always have to explain it is much closer to the original finish that the 5 ft deep reflections other guys have with their multi thousand dollar paint jobs. Had one of my cars in a movie or two over the years, as have good friends with 40's and 50's vehicles. The movie company "dusted" them, on film, looked like they hadn't been washed in a LONG time. Someone told me they also had appliques for windows to make them look cracked or fogged. Greg--yes, they did a good job with the TR4 in the Chipmunk movie. Mike-to each his own, but I am with you on the paint. TOC--I obviously painted with a broad brush, like most things I probably notice more if it is wrong than if it is right. Yea, if someone wants to get a state of the art finish, let them have at it. And some cars do look better than original that way.